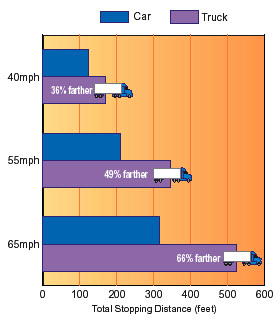 The stopping distance required for a large truck traveling at 55 mph is almost 50 percent greater than that needed for a car. Angle, rear-end, and head-on collisions are the most common types of work zone crashes involving large trucks. Almost 30 percent of all work zone crashes involve large trucks. The number of people killed in work zone crashes involving large trucks has been increasing. Over 1,000 fatalities and over 18,000 injuries have occurred during the last 5 years. 65 percent of fatal work zone crashes involving large trucks occur during the day. Six times as many fatal work zone crashes involving large trucks occur on Monday through Friday (the weekdays) compared to Saturday and Sunday (the weekend). About 60 percent of fatal work zone crashes involving large trucks take place on divided roads. Over 70 percent of fatal work zone crashes involving large trucks occur on level roadways. Almost 90 percent of fatal work zone crashes involving large trucks occur on straight roads. Work zones often result in narrow lanes, merging, shifting lanes, slowing and stopping traffic, unexpected work vehicles entering the traffic flow, temporary speed limit adjustments, flaggers in the roadway, confused drivers, and other disruptions. Adhere to instructions by the flagger. Leave enough space between you and the vehicle in front of you to stop safely. Take advantage of your driving height and anticipate braking situations. Be prepared to slow down or stop suddenly in a work zone. Get into the correct lane well in advance of lane closures. Be cautious of motorists racing to get ahead of you in merge areas. 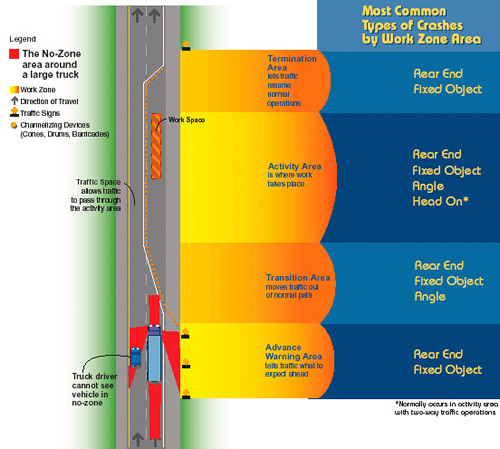 Be aware of your No-Zone areas where crashes are more likely to occur. Avoid work zones by using alternate routes where possible. Large truck drivers should use extra caution in the merge areas and get in the correct lane well in advance of the lane closure. One-third of all crashes between large trucks and cars happen in the danger areas around the truck. These danger areas, known as the No-Zone, are along the sides, front, and rear of trucks where the driver cannot see, even with the best mirrors.